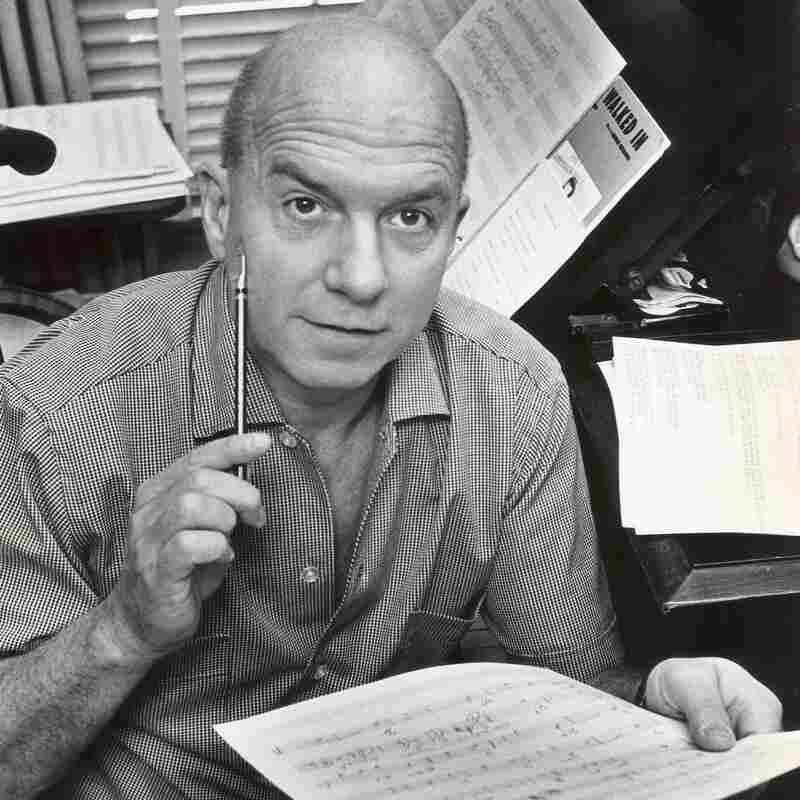 The Composer Who Tested Fighter Planes And Partied With Sinatra A cool ladies' man with a shaved head, Jimmy Van Heusen was one of America's greatest popular composers. He wrote "Darn That Dream," "Swinging on a Star," "All the Way," "High Hopes," "Here's That Rainy Day," "Come Fly With Me" and more. 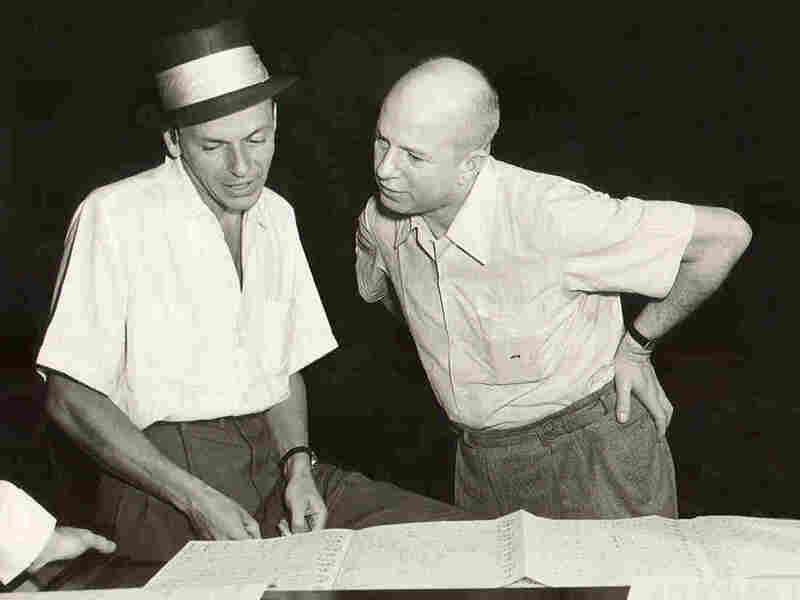 Jimmy Van Heusen with Frank Sinatra in the 1950s. Van Heusen wrote dozens of songs for the crooner and became Sinatra's close friend and confidant. You've never heard of Jimmy Van Heusen? Well, the American Society of Composers, Authors and Publishers has. You certainly know many of his songs, says Brook Babcock, Van Heusen's grandnephew and president of his publishing company. "There's 330,000 songwriters listed with ASCAP. Van Heusen, as far as his catalog, is probably within the Top 20. That's a pretty good number," Babcock says. 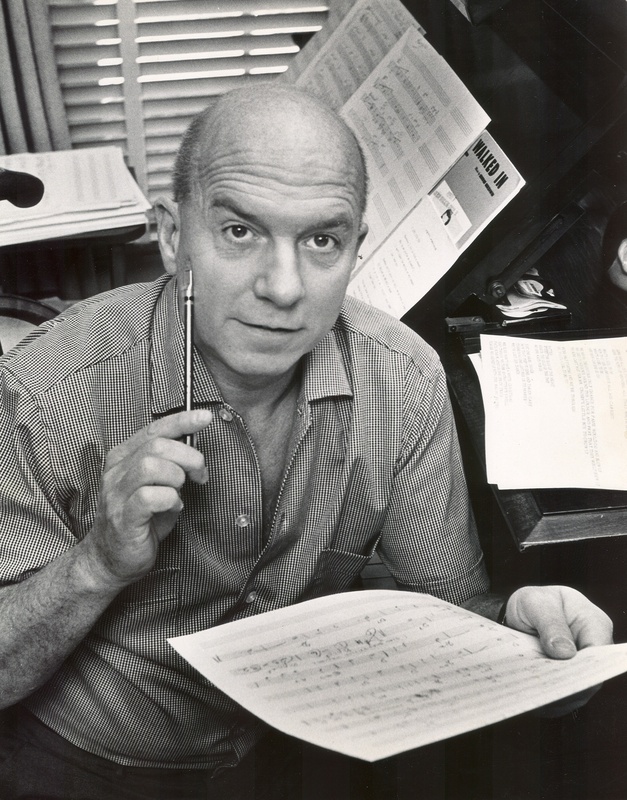 "Yes, he's not as known as Cole Porter, Ira Gershwin, George Gershwin, but when you put that name out there — Jimmy Van Heusen — to be in that Top 20 is, to me, pretty significant." The songwriter behind "Swinging on a Star," "Love and Marriage," "Come Fly with Me" and "My Kind of Town" won four Academy Awards and one Emmy for his work; he would have been 100 today. Jimmy Van Heusen was born Edward Chester Babcock and grew up in Syracuse, N.Y., where he was a terrible student but a born entertainer. Van Heusen at work in the 1960s. "I don't think there's a school in Syracuse that I didn't attend," he told an interviewer on Armed Forces Radio in the 1960s. "And I was usually unceremoniously expelled." Among his crimes: a suggestive performance at a high-school assembly. "I chose, for my song, 'My Canary Has Circles Under His Eyes,' " he said. "It was written by Yip Harburg, and I just copied it off the air. But it went, 'Since making whoopee became all the rage / It's gotten round to the old birdcage / And my canary's got circles under his eyes.' ... It was the biggest laugh! You never heard 2,000 kids laugh so hard!" Babcock took his pen name from the dress-shirt brand Phillips-Van Heusen. He made his way to New York, where Harold Arlen gave him a shot to write for the Cotton Club revue. Cab Calloway was the first to record a Van Heusen song. A few years later, Van Heusen wrote a big hit for Benny Goodman, "Darn That Dream." Bing Crosby heard it and brought Van Heusen to California, where the composer began a successful collaboration with lyricist Johnny Burke. In Hollywood, Van Heusen became known as a man about town. Even though he wasn't conventionally handsome, he always had a beautiful woman on his arm. And, Brook Babcock says, he threw great parties. "His house was always open, his bar was always open," Babcock says. "Even when he was not home, people could go over to his house and basically let their hair down, so to speak, and take it easy." But Babcock says Van Heusen had another side. During World War II, while writing songs for Hollywood movies, he was also doing dangerous work as a fighter test pilot. "He would work from 5 a.m. to 1 p.m., five days a week, going over to the Lockheed plant, flying these airplanes on behalf of the Air Force," Babcock says. "And then, from 2 o'clock onward, he was writing songs." 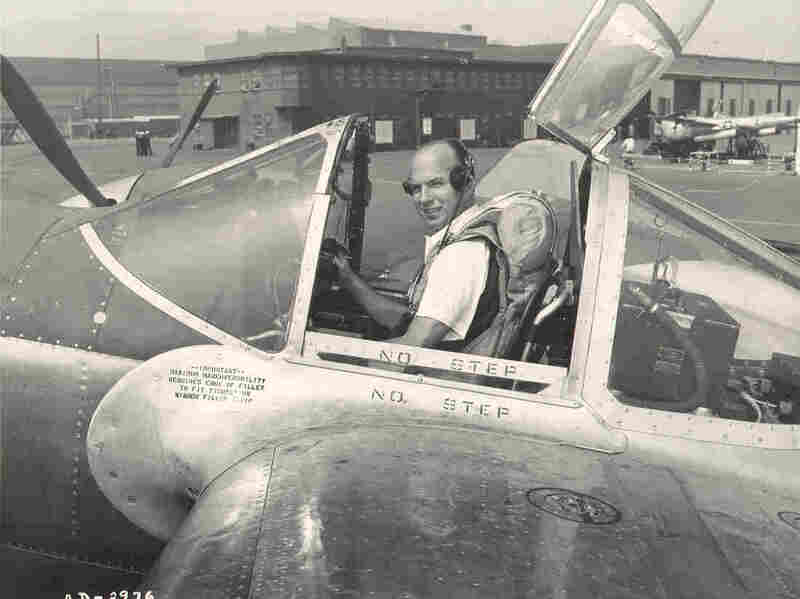 Van Heusen in his second life as a World War II-era test pilot. Singer Michael Feinstein says Van Heusen was a man of contradictions, both in his life and in his music. One of Van Heusen's partying pals was Frank Sinatra, and when the partnership with Johnny Burke came to an end, Sinatra helped pair the composer with lyricist Sammy Cahn. Together, they wrote a remarkable 76 songs for the crooner. "The thing I find fascinating about them," Feinstein says, "is that Sinatra is famous for changing lyrics and switching around things in songs to make them his own, but he never changed anything in the Van Heusen-Cahn songs." Sinatra and Van Heusen were such good friends that, at times, they roomed together. Chuck Granata, who has produced several Sinatra reissues, says Van Heusen was Sinatra's confidant when the singer was breaking up with Ava Gardner. "He was the one that saw Frank Sinatra's desperation," Granata says. "When you you think about the underlying subtext of songs like 'Only the Lonely' and 'No One Cares,' which were Van Heusen melodies, I think Van Heusen was able to distill the raw emotion that he saw in Frank in that mid- to late-1950s period and really bring it out in those recordings and those songs." When Jimmy Van Heusen died, he was buried in the Sinatra family plot. "There were two people who were nonfamily members who Sinatra wanted near him through eternity," Granata says. "[The first was] his longtime friend, bodyguard and very close companion, Jilly Rizzo, and the second was Jimmy Van Heusen. And I think that's the ultimate tribute, really. That really speaks volumes about Sinatra's admiration and adoration for those two people." Jimmy Van Heusen was 77 when he died. His headstone reads, "Swinging on a Star."